The Sidamo are warrior tribe of some 2,000,000 living in southwest Ethiopia. That warrior ethic has continued into modern times. In 1935, when Benito Mussolini's forces invaded Ethiopia, Sidamo warriors were among the 250,000 marshaled by Ethiopian king Haile Sellassie. The Ethiopians fought heroically, many armed only with traditional tribal weapons. This left them vulnerable the tanks and poison gas of the Italian dictator. 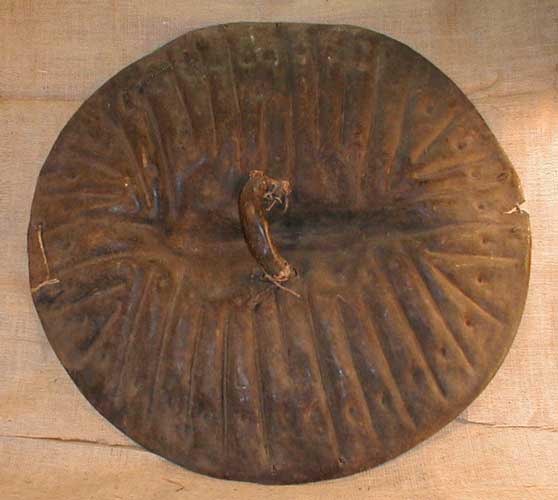 The genuine Sidamo battle shield celebrates the fierce independence of the Sidamo people and the nation of Ethiopia. The intricate designs formed into the shield tell the story of it's owner's bravery in combat - as well as provide rigidity. About 30 inches in diameter, it is made of extremely tough pachyderm hide - probably rhinoceros. The process of molding this extremely tough hide into shape is labor-intensive.